There are different displays at the Hendersonville Public Library, off Main St. down 3rd Ave. Pisgah Forest Pottery has been exhibited frequently. Walter B. Stephen had operated potteries in Tennessee and in Skyland, North Carolina, then moved to Pisgah Forest in 1926. 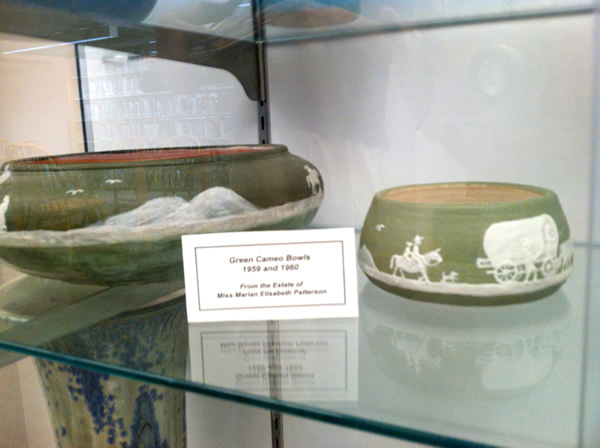 At the Pisgah Forest Pottery, Walter was inspired by English Wedgewood jasperware. He created cameo ware with scenes hand painted on with slip to create cameo scenes from American life. Some are Western themes, with buffalo and covered wagons. Others are more local, with cabins, fiddlers and other scenes from Mountain life. Walter Stephen also experimented with crystalline glazes. He is said to have pioneered the first crystalline glazes in the South. These are very complex glazes which he was able to master through trial and error. When I first moved here, the pottery was still open and run by Thomas Case, Walter Stephen’s step-grandson. When he died, the contents of the pottery, some dating as far back as 1917, were donated to the North Carolina Museum of History in Raleigh. You can see more Pisgah Forest Pottery at the Asheville Art Museum, 175 Biltmore Avenue · Asheville, NC.